In the 1920s, South Edgemere in Queens was a thriving summertime destination replete with bungalows and a boardwalk. Nowadays, these 20 or so unused blocks have been abandoned to seaside squatters and gangs of wild dogs. Over the decades nature has reclaimed southern Edgemere. Groves of trees, acres of bushes, wild flowers, rabbits, and flocks of birds all thrive within sight of the nearby elevated MTA line. However, few people can be seen walking through this no-mans-land, perhaps because of its history of wild dog attacks. 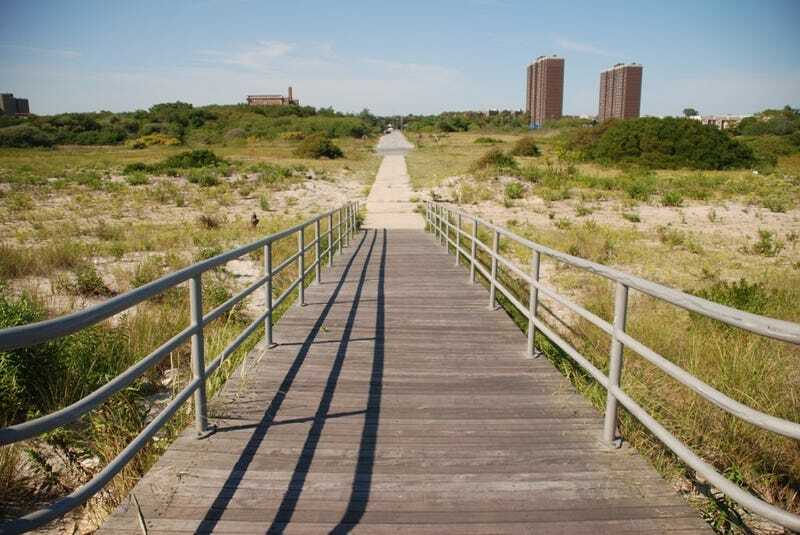 In 2001, two Rockaway residents "were brutalized by a pack of wild dogs" in the Arverne Urban Renewal Area, according to The Wave. The dogs came from an abandoned block, "stalked" their first victim, and "dragged him off the boardwalk onto an adjacent lot and began consuming his flesh," according to The Wave. In spite of this, several homeless camps are currently hidden deep in the Edgemere overgrowth. Some are as simple as a mattress tossed in the bushes or a sofa placed in a clearing. Others are more elaborate, including one camp with platform beds on a stone patio surrounded by a garden and fence. Another camp is large enough to house several families. You can learn more about Kensinger's journey into this mostly uninhabited space (and view more stark photos) at his blog.